Ana Mandara Ninh Binh Resort covers 16.2 hectares in Van Long eco-tourism complex in Gia Vien district, Ninh Binh province. Northern Vietnamese inspired architecture makes Ana Mandara Ninh Binh a highlight in northern tourism real estate. 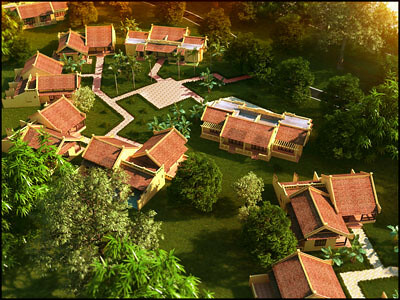 The resort is a tourism project to celebrate the millennial founding ceremony of Thang Long – Hanoi. Currently, Tan Phu Joint Stock Company and Ninh Van Bay Tourism Real Estate Joint Stock Company are actively completing last steps to open in October 2010. Ms Nguyen Van Huong, Director of Tan Phu Joint Stock Company – the builder of the resort, said: Ana Mandara Ninh Binh has 51 villas with 170 bedrooms, rated 4 stars ++. In addition, the resort also has restaurants, bars, spa and fitness centre, two swimming pools, tennis courts, event zone, convention rooms and childcare areas. Villas are designed in the ancient northern delta style: Earthen walls, shoe head-style tiles and wooden frames. With a skilful combination of modern and traditional styles, and close to nature, Ninh Van Bay Tourism Real Estate Joint Stock Company is creating an unprecedented work. In the past two years, tourism property projects have drawn deep interest from companies; thus, products are more diversified. As an inseparable part of tourism, most tourism property projects are built in beautiful places like Hue, Da Nang, Nha Trang and Da Lat. 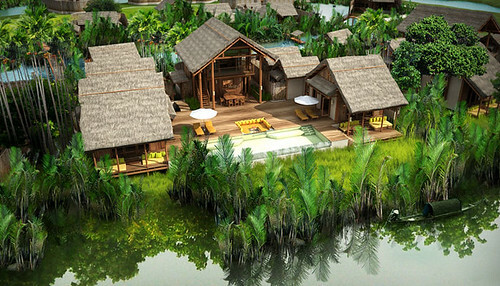 Therefore, when Ninh Van Bay Tourism Real Estate Joint Stock Company decided to invest in Ana Mandara Ninh Binh resort, it surprised many property investors who were doubtful of the success of project. 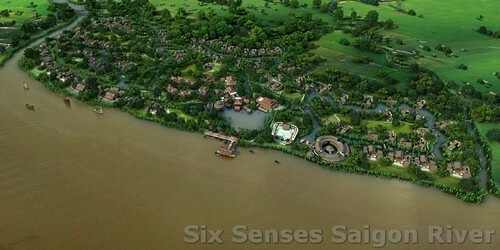 Six Senses Latitude Sai Gon River is owned by Hai Dung Limited Company – a 95% owned subsidiary of Ninh Van Bay . The project situated at Ben Co village, Dai Phuoc ward, Nhon Trach district, Dong Nai province. The project seats right on the 1000-meters riverside of Dong Nai River. Its north shares the border with Cai River (a branch of Dong Nai River), the south borders with a high voltage electric line and a road under designed, the east and west boders with Cong Lon canal. Situated on a very advantageous area and is 45 minute bus travel from Tan Son Nhat airport, about 25 minute ferry travel from District 1 center and 30 kilometers far from Long Thanh airport (Dong Nai province). The project is managed by Six Senses Corporation, the Thailand-based world’s leading property management firm in a 3-year management contract with Ninh Van Bay from its first operating date. – 288,909 m2 of leased land whose payment will be made annually for period of 50 years. The project was kicked off in Sep 2008, and is expected to finish in mid 2011. 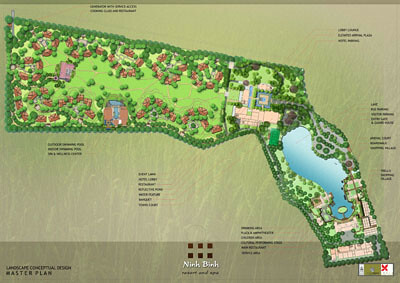 The project consists of resort (40 apartments, 70 luxury villas and 2 president villas) and 50 villas for sales and property arrangements. Ninh Van Bay Tourism and Real Estate Joint Stock Co (Ninh Van Bay) lately introduced Ana Mangara Club in Singapore on April 22 & 23. At the same time, the company started issuing long-term vacation cards with its strategic partner of Resort Condominium International Group (RCI). Ana Mandara is not only one of the most well-known trademarks in Vietnam’s tourism industry but also recognised in domestic and international markets with high-class service quality. Its Evason Ana Mandara Nha Trang has recently been selected as one of 25 best resorts in Asia in 2009, together with other awards offered by the world’s leading travel magazines. At present, Ninh Van Bay has cooperated with other partners to develop Ana Mandara Vacation Club, including those high-class resorts under trademark of Ana Mandara. 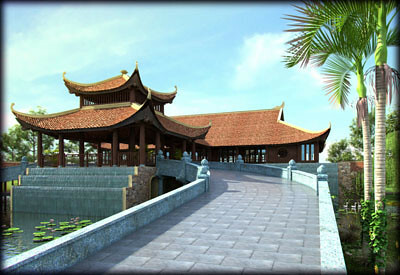 In details, the Ana Mandara Resort & Spa Ninh Binh is one part of Van Long – Ninh Binh eco-tourism complex that is supposed to be opened in October 2010. Apart from that, the company also owns other resorts in central and southern regions such as Evason Ana Mandara Resort & Spa Nha Trang, Ana Mandara Resort & Spa Hue and Ana Mandara Da Lat. The RCI Group, under the US-based Wyndham Group is one of the leading groups in the world in fields of vacation exchange. The group has successfully issued long-term vacation cards and seasonal vacation cards for two trademarks of RCI and TRC. Now RCI has three million card members who enjoy their vacations in 3,700 resorts in all over the world. Apart from its cooperation relation with long-term strategic partner of RCI and introduction of Ana Mandara Club, Ninh Van Bay planned to continue concentrating on developing tourism and real estate trading services, and long-term vacation cards. On April 14, the company closed the list of shareholders for registering to deposit shares, in order to prepare for its official share-listing on stock market in Q2 of 2010. 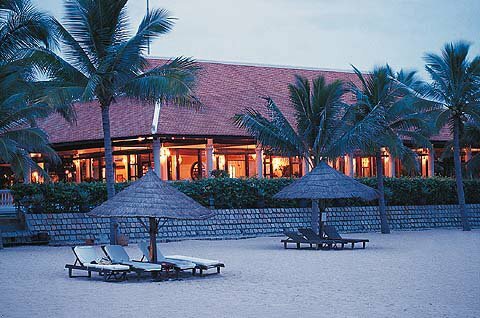 Set on an isolated beach a scenic 15km drive from Hue, Ana Mandara beach Resort & Spa Hue is putting Thuan An Beach firmly on the international tourist map. Opening early 2010, Ana mandara promises a lot. 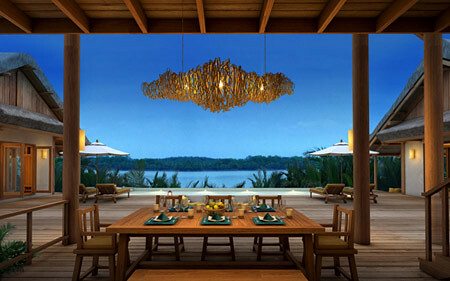 The impressive lobby opens out towards the sea with an infinity lotus pool lying in between. The grounds contain lush, green tropical gardens and coconut palms. All rooms offer great views of either the beach or sea. Fitted out with dark wood finishs and fine textures, the most exclusive pool villas have their own 48sqm, swimming pools. Nowhere is the sense of space more evidenced than at Ana Mandara Beach Resort & Spa Hue’s state of the art spa. Large treatment rooms spread out around a central pond, creating a harmony with nature and water. Treatments include the resort’s after a long day’s clambering around Hue’s ancient citadel or the Nguyen tombs. The resort offers the biggest ballroom in Hue, ideal for any event from small board meetings to a big wedding for 500 people or team building. 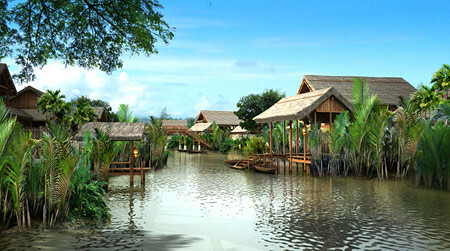 Providing five-star facilities in an off-the-beaten-track location Ana Mandara is setting a trend for Central Vietnam. The Ana Mandara Beach Resort and Spa begins with liberating sense of space – your villas or guests rooms are among Hue’s largest. Ana Mandara Beach Resort and Spa offers 78 varying styles of accommodation including Beach pool villas, beach villas, duplex rooms and deluxe rooms with a wide range of choice in decor and style. ABR villas and rooms are designed with the most modern and complete facilities. 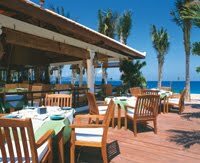 – Each villa has attractive garden and sea views, Terrace has 40 square meters of area. – Living room at the ground floor with an open terrace and bed room on the upper floor with a large sea view terrace. – One bed room, one living room, one bathroom with shower on the ground floor one full bath-room at the first floor next to the bed room. – Total Area of each pool villa is 275 square meters. – 48 square meter total.